As a complimentary service, Advanceware offers various types of hardware that can be used with AdvancePro or its different modules. All hardware is supplied by third parties and all hardware sales are final with no refund option. All hardware comes with a manufacturer warranty. To make things easier we’ve narrowed the field for you and included a cross section of wireless terminals and scanners from which you can choose the one best suited to your needs. All hardware sales are final with no refund option. All hardware comes with a manufacturer warranty. Pricing subject to change without notice. For all orders, $30 will be added for shipping and handling. 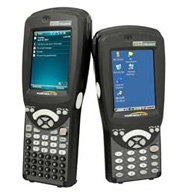 While it might have a somewhat different form factor, the Dolphin 7600 is among the most ergonomic mobile bar code scanning terminals currently available on the market. Available in either a 29 or 38 key version, the omnidirectional area imager scanner makes reading bar codes an easy task from almost any angle. The "bigger brother" to the 7600 model adds the pistol grip that's preferred by most warehouse personnel and a sloped screen that makes it easier to read prompts and error messages. The omnidirectional area imager scanner is a substantial improvement over laser-based scanners. This is probably the most versatile mobile scanning terminal on the market today and comes from a long-time Canadian manufacturer of industrial-grade mobile computers. The addition of a bolt-on pistol grip turns this device from a "flashlight style" scanner to a more "point and shoot" format and the data radio and bar code scanner can both be field-upgraded by anyone! 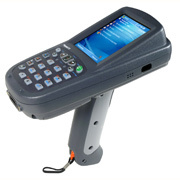 The model we're providing here has a 1D bar code imager scanner and 802.11b/g data radio. 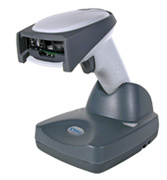 This mid-class tethered bar code scanner runs circles around similar models from other manufacturers, having superior durability, ergonomics, and aggressive scanning. This is basically the model 3800g - but in a cordless model. Roam up to 10 metres from your PC and scan bar codes from heavy or hard-to-reach items. Economical scanner, small and simple to use. 100 Scans per second. 5 inch depth of field. includes stand. 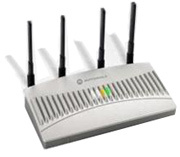 This industrial-grade wireless access point provides features and functions well above any "consumer grade" access point, including: replaceable antennas; power over Ethernet; intelligent roaming; Wi-Fi Multimedia (WMM™) Quality of Service (QoS) and voice prioritization; integrated router, firewall and DHCP server; triple methodology rogue AP detection: on-channel, mobile unit, dedicated radio dual-band scanning; 802.11i, WPA2 and WPA; triple-DES IPSec encryption; VPN client. NiceLabel is a flexible bar code label design and printing package that supports over 500 varieties of bar code printers. It is available in three basic flavors: Express-basic label design capabilities, interface to text files. Pro-Advanced design capabilities, interface to a wide variety of database and other files. Suite-Pro plus sophisticated utilities and tools to build applications (Niceform-form based from end for label printing, Nicewatch-event driven print server for network label printing, Nicedata-database manager, NiceMemMaster-downloadable fonts and formats to printer memories & Win CE remote label printing). The basic packages include the design program and printing engine, however, for network installations the print engine or multi-user access is available. 4.25 inch print width Direct thermal printer. USB standard, Ethernet optional. 2 year warranty.